Miriam E. Johannes, 93, formerly of Mink Ranch Road, Knellsville, (town of Port Washington) died Friday, September 18, 2009 at Linden Grove, Town Line Road, Menomonee Falls where she had been a resident. 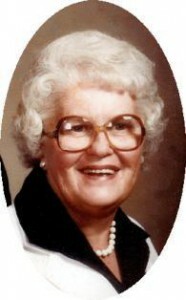 She was born on August 26, 1916 in Naperville, IL to Herbert S. and Mabel Swartz Hollopeter. Growing up in Indiana, she graduated from Goshen College in Goshen, IN and taught in South Bend for a while. On October 6, 1945, she married John H. Johannes of Port Washington at St. Patrick’s Church in South Bend. He had graduated from Notre Dame University, also of South Bend. In 1947, they moved to Port Washington where he operated a Canning and Mink business at their Knellsville (Town of Port Washington) home for many years. Her husband preceded her in death on November 19, 2001. Miriam taught 4th grade at Lincoln Elementary School in Port Washington for many years and one year at St. Mary’s Catholic School in Port Washington. After 33 years of teaching, she and her husband retired and moved to Hubertus in 1978. They also enjoyed their time spent in Bonita Springs, Florida. She was past choir director of St. Mary’s Church Choir, Port Washington, active with St. Peter�s parish, Port Washington and the former Daughters of Isabella. Although the capacity to speak was taken by strokes, the Lord preserved her ability to sing. She especially enjoyed singing her favorite hymns with family, friends, and care givers at Linden Grove Nursing Home. She also faithfully attended church services and Ladie’s Bible study there. She enjoyed being outside and mowing their vast lawns in Knellsville and later at Hubertus. She and husband John took pleasure in a morning trip for breakfast followed by a visit to the Ocean beach. Her great sense of humor made her fun to be around. She used it to make her children, grandchildren and great-grandchildren smile..
She is survived by four children; Dianne (Ken) Borgen of Plover; Adele Johannes of Mexico; Joe (Sue Ann) Johannes of Cedar Grove and John E. (Deborah) Johannes of Muskego; seven grandchildren, four great-grandchildren, nieces, nephews, other relatives and friends. She is preceded in death by her husband and sister Vivian Setty. Funeral services will be held at 11AM Monday, September 21, 2009 at the POOLE FUNERAL HOME, 203 N. Wisconsin St., Port Washington. Interment will be at St. Mary’s Cemetery, Port Washington. A visitation will be 10-11AM Monday prior to the service. The Reverend Mike Tess, a family nephew and Reverend James Ernster will be the officiants. Memorials of your choice appreciated.